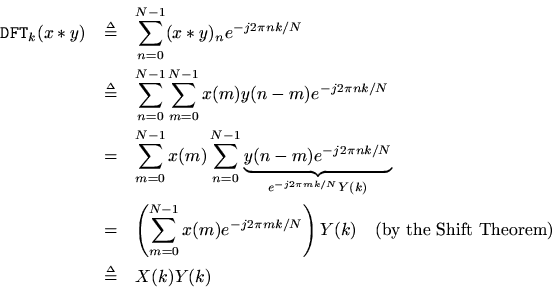 This is perhaps the most important single Fourier theorem of all. It is the basis of a large number of applications of the FFT. Since the FFT provides a fast Fourier transform, it also provides fast convolution, thanks to the convolution theorem. It turns out that using the FFT to perform convolution is really more efficient in practice only for reasonably long convolutions, such as . For much longer convolutions, the savings become enormous compared with “direct” convolution. This happens because direct convolution requires on the order of operations (multiplications and additions), while FFT-based convolution requires on the order of operations.